The Watertown Yacht Club (WYC), founded in 1940 and incorporated on 21 September 1942, is situated at Sunset Bay on the Charles River. 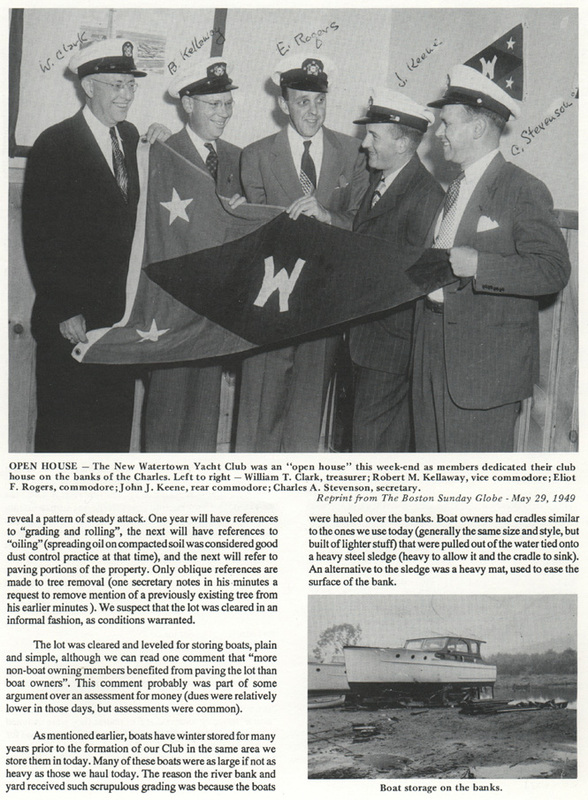 The oldest document related to the WYC, dated 7 November 1941, mentions a to-be founded Riverton Yacht Club. On the first regular business meeting of the new club, 18 December 1941, its current name was unanimously accepted. "The newly formed Burgee Committee presented three different proposed designs, none of which were found to be used elsewhere according to Lloyd's Register of Yacht Clubs. After due deliberation (some purists felt that a letter on a burgee was too radical) a burgee design was finally selected and fifty burgees were ordered. They sold for a dollar each for cotton and two dollar for wool with a 15 cent surcharge levied on each burgee to pay for the club's large burgee".